Created with http://www.godeckyourself.com, using the new markup. After creating a first card, changing templates of newly created secondary cards will not work. Workaround: create a second card, save your card, and then reopen it to change style. I've been reading up on the state of affairs of 4e and I'm a bit surprised by the apparent lack of 3rd party tools. 3.5e used to have a huge collection of 3rd party materials and handful of good character creators. Is 4E catching on in this regard? 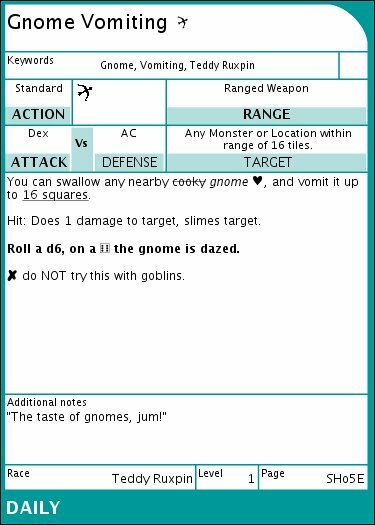 What do you use for 4e character creation? With a huge delay the redblade forums have finally been moved to a new (and properly updated) server. The issue that has prevented me and many others from logging in should be alleviated now. I'm aware of the forum connection issues and i'm working on getting the login issues resolved. It is probably going to take a few days before this issue is resolved. Hi all! Sorry to keep you waiting. I'm still alive. I'll post an update soon!